[prMac.com] Gibsons (BC) Canada - Today Sprightly Software introduces 2 Turntables and a Microphone 3.1 for iPad. This highly advanced DJ setup features pro decks, crafted to reproduce the subtle dynamics of vinyl. The new version combines digital loop technology and turntablism, bringing music into the space age of creative expression. The version 3.1 update expands hardware support to all iPad devices running iOS 8 or later. This update also provides performance, stability, and sound quality refinements, furthering the development of this modern DJ app. Whether it's creating original music, recording live loops, remixing, or live DJing, 2 Turntables offers everything needed to produce professional quality music. The app allows users to perform traditional turntable techniques like the Flare and Crab scratch with its innovative crossfader controls. 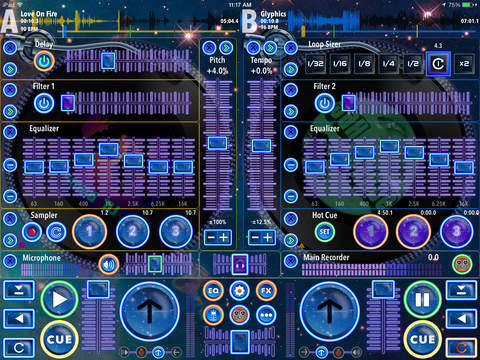 DJs can now bring looping up to the next level with multiple looping methods, including cue, resize, and save. Users can easily create loops from any audio recording in the studio or during performance. 2 Turntables and a Microphone 3.1 is on sale starting today. It's only $4.99 (USD) for a limited time and is available worldwide through the App Store. There is also a Lite version available.